The handshake has been around since ancient times, and to this days it remains common among many cultures and hemispheres. 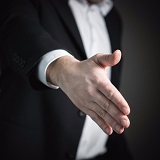 A good handshake can have a major impact on the decision of whether you will get a new job. Before you shake hands, make sure your hands are free and not cold. Avoid holding cold drinks with your right hand. Make sure to use plenty of eye contact, and smile warmly but briefly. A smile that is too large is not good for a first impression. Keep your head straight, without tilting it in any way. Face the person fully. Keep your hand perfectly perpendicular. If you’re in doubt, angle your thumb straight to the ceiling. The space between your thumb and index finger should be wide open to make sure you get optimal thumb-web contact. Ensure contact between the palms of your hands by keeping your palm flat—not cupped—and by draping your hand across your partner’s diagonally. Try to wrap your fingers around your partner’s hand, scaling them one by one, as if you were giving a hug with your hand. Once full contact is made, lock your thumb down and squeeze firmly, about as much as your partner does. Shake from the elbow (not the wrist), linger for a moment if you want to convey particular warmth, and step back.